Facebook’s Re-Design: 10,000 Hours in Action | Digital Hello. I’ve never been much of a Facebooker and have, at times, been critical of past moves but today Facebook did something to be respected and applauded. Zuck & Co. just announced a brand new re-design of the heart of the platform, the news feed and also the next major area of the service, photos. The change will be rolling out the changes in a slow and controlled manner in order to measure response and effectiveness and whether these changes succeed or fail, time will tell but the cultural aspect of this move is what we need to understand. Facebook has over a Billion users and it is re-vamping everything that matters. Why? Stay relevant, stay ahead, don’t get left behind. How many companies can you think of that have the guts to reinvent themselves? Not the sugar-coating, lip service type re-invention but truly shake things up? Of that list, how many do it when they’re flying high not when they’re sliding or looking up from the gutter? I can’t think of one. Necessity is a subjective term. Is it necessary for Facebook to change things up in order to make more money from advertising or keep users that are flocking to more visual products like Pinterest? Yes, definitely. At the other end of the spectrum, was it a necessity for Jack Welsh to bring Chrysler back from the gutter with the K-car. No one can argue otherwise. The difference it the amount of choice at the given time. Zuck and company could have waited until things were absolutely necessary but decided to do what winners do, keep battling even at the top of their game. That’s something to be admired and learned from. In his amazing book Outliers, Malcolm Gladwell notes that it takes 10,000 hours of doing something to achieve mastery. Also, those that are masters achieved the status by continuing to practice and pursue even after reaching success. Michael Jordan was constantly the first one at the gym and the last one to leave. Michael Jordan! 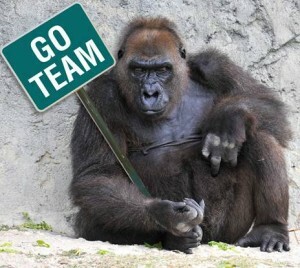 Never forget that together with passion and belief, what makes you successful is hard work, intelligence, and risk no matter if you’re a start-up or an 800-pound gorilla. If you’re a company that has lost its ability to make real change then the change around you will spell your end. Don’t hold on to what used to work in the past. It’s in the past. We need to applaud those that keep that start-up culture and fortitude even when they’re now the 800-pounder. The Great Gretzky once said you miss 100% of the shots you don’t take. Congrats to Facebook for still taking shots.